I hope we’re far enough away from Christmas for you to tolerate another poultry recipe – I promise you this one is worlds away from roast-turkey-with-all-the-trimmings. I’m a big fan of poaching a whole chicken rather than roasting it, especially if we don’t want to eat it all at one meal. It is an economical method of cooking but you also end up with beautifully moist, delicately flavoured meat. 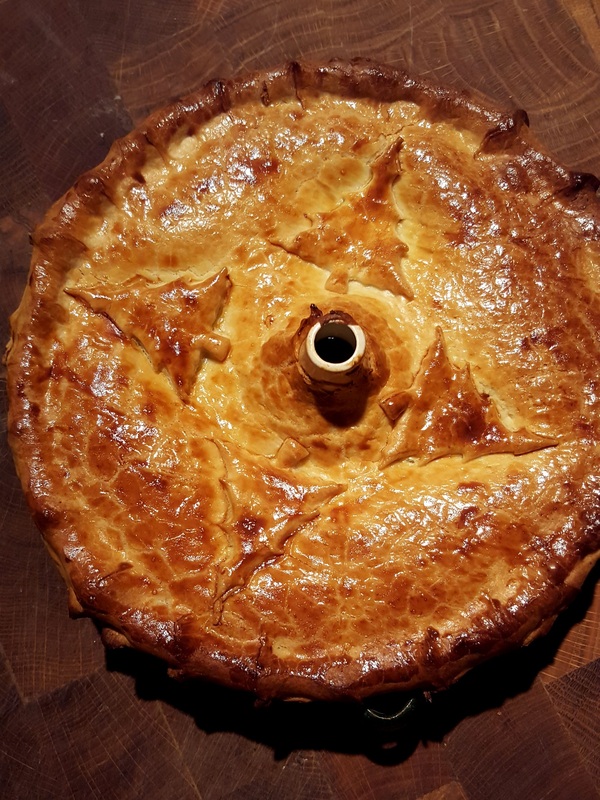 The recipe below will serve four to six people but as I was cooking for two, I had enough left over to make a big chicken and mushroom pie (like this one but with more mushrooms and no leeks). And there was lots of broth to make either a laksa or a chicken and sweetcorn soup for another day. This was Meal Number One: we ate it with baby potatoes, spiced carrots and a tarragon cream, all gentle flavours. If you want something more pokey you could serve the chicken with a stingingly garlicky aioli instead or with harissa for a chilli kick. If you make it for more than four I suggest you increase the quantity of sauce. A rather confusing ingredients pic, sorry. Some of these were the veg on the side. Stuff the bird with the tarragon stalks and bay leaves. Put it in a stock pot big enough to hold the bird and enough water to cover it by about 2.5 cm. Add 1 tspn of salt, the roughly chopped carrots and celery and the peppercorns. Crumble in the stock cube, if using. I find it boosts the flavour without, at this dilution, tasting too packet-y but leave it out if you like. Bring to the boil and skim off any froth. Put on a lid, turn down to a simmer and cook for about an hour, depending on size, or until the leg bone pulls easily away from the chicken. Once it’s done, remove the bird and keep it warm. Strain the stock – you’ll need some for the sauce. The rest can be reduced further to make a fabulous chicken broth for another day. To make the sauce, put the wine in a small pan and reduce until you have just a couple of tablespoons left. Add the chicken broth and reduce by a third. Pour in the cream and reduce again until the mixture has thickened enough to coat the back of a spoon. Stir in the chopped tarragon and season to taste. Portion up the chicken – I prefer to remove the skin – and serve it with the sauce poured over. Thrift is not my middle name, as friends who’ve seen me shopping will attest. But I do hate waste in the kitchen so I try to get maximum value out of food, if for no other reason than that I feel I owe that deceased chicken a bit of love and respect. So this pie was Meal Numbers Two and Three, eaten hot one day, cold the next. The observant reader may notice I made this in the run-up to Christmas and have had the recipe up my sleeve. 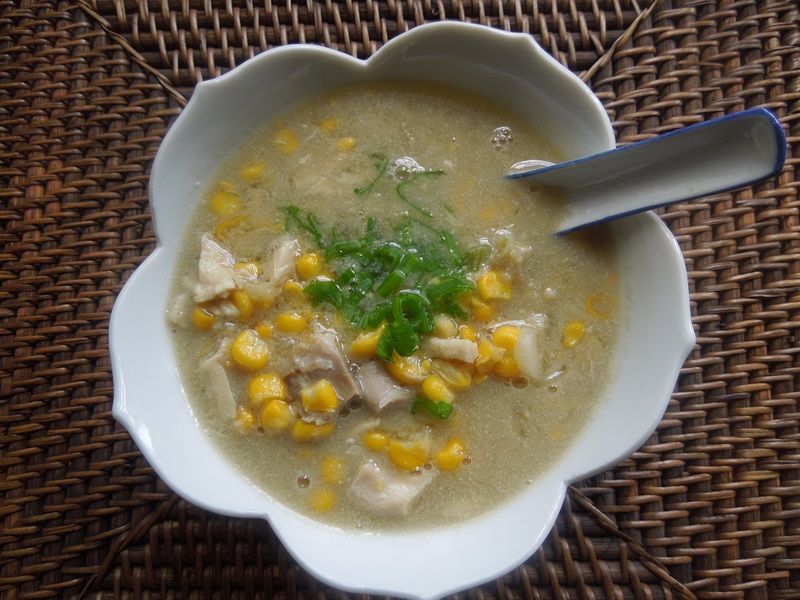 And below, a version of this chicken and sweetcorn soup made Meal Number Four. Not a bad series of results from one chook, I reckon. 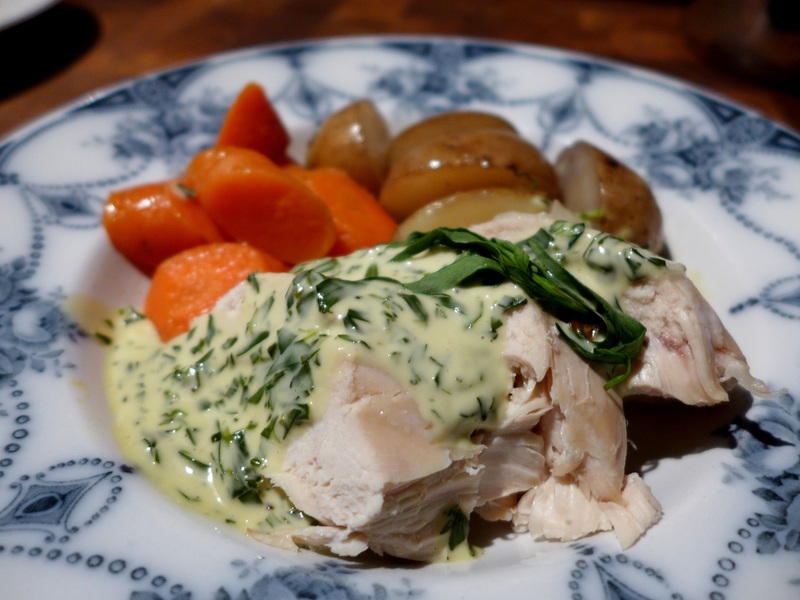 This entry was posted in Chicken and other poultry, Mains and tagged chicken and mushroom pie, chicken and sweetcorn soup, poached chicken, poached chicken with tarragon cream, tarragon cream sauce by Linda Duffin. Bookmark the permalink. I am definitely going to try this method! 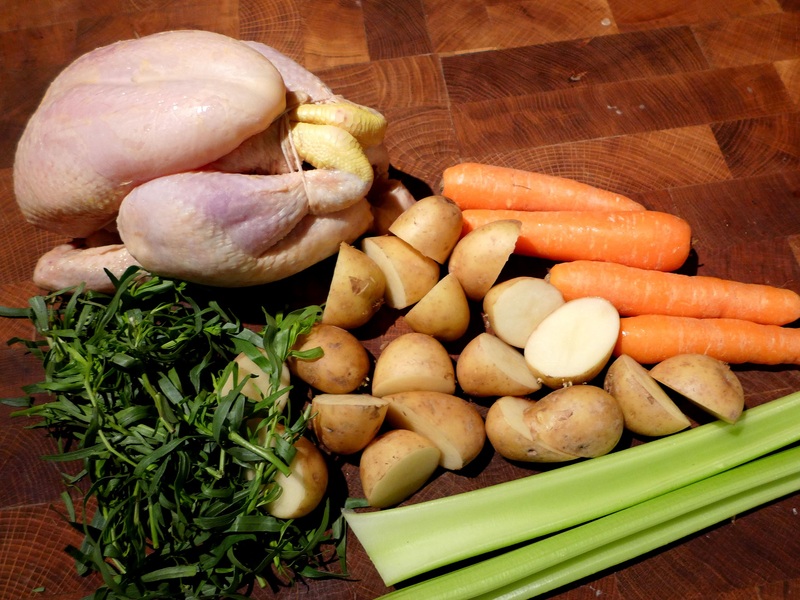 Roast chicken yields no broth and is dry by the second or third day. All recipes look lovely. Thank you! Well, on reflection ‘Not like’. Obviously. I can’t decide which dish is the best. 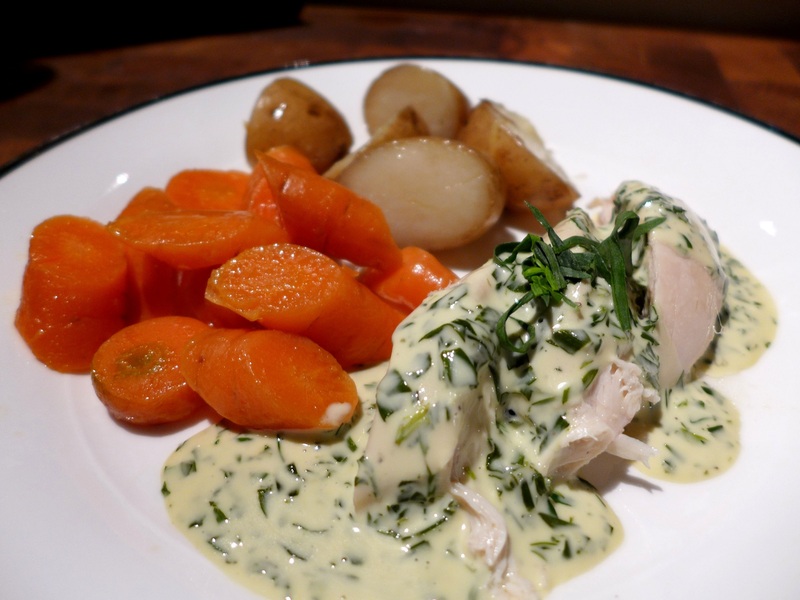 Chicken with tarragon is my favourite combination for it. Every other herb is a poor pretender to the throne. I like everything around chicken. This recipe sounds totally great, I will try it. Thanks.